Download "Faculty Compensation Plan. Department of Family Medicine and Community Health. UMass Memorial Health Care/University of Massachusetts Medical School"
3 Faculty Compensation Plan Department of Family Medicine and Community Health UMass Memorial Health Care/University of Massachusetts Medical School Introduction The primary goal of this Faculty Compensation Plan is to rationalize faculty compensation across the Department of Family Medicine and Community Health, linking salaries to a set of expectations for major aspects of faculty responsibility. A second goal is to recognize and reward excellence and productivity that goes beyond expectations. Finally, these guidelines are intended to improve the financial viability of the Department and the institution. The Plan strives to be competitive, so as to attract and retain faculty of the highest caliber. The Plan strives to be aligned with the vision and mission statements of UMass Memorial Health Care and the University of Massachusetts Medical School, and to reflect the Department s vision and mission statements: Vision: Our Department will be nationally recognized for its innovation and impact in Family Medicine and Community Health Mission: Our Department sets the highest standards of patient care, education, and research in Family Medicine and in Community Health, and is committed to improving the health of populations, with special emphasis on those most vulnerable The Plan strives to support all aspects of the Department s mission, including clinical care, education, research, and community service. While it is not feasible that any individual faculty member can focus on all aspects of the Department s mission, each is a part of a multifaceted enterprise. Just as faculty with major academic responsibilities benefit from being a part of a successful clinical system, so do faculty with major clinical responsibilities benefit from being a part of an academic system of the highest caliber. The Plan strives to reflect the value of a fully productive academic and/or clinical career, with clear relationships between the funding sources that support each base salary and the responsibilities that are linked to each of these sources. The Plan strives to recognize faculty who make contributions to the clinical system and to the medical school, and to support leadership and administration, with an emphasis on leadership development and on the personal and professional development of the faculty. 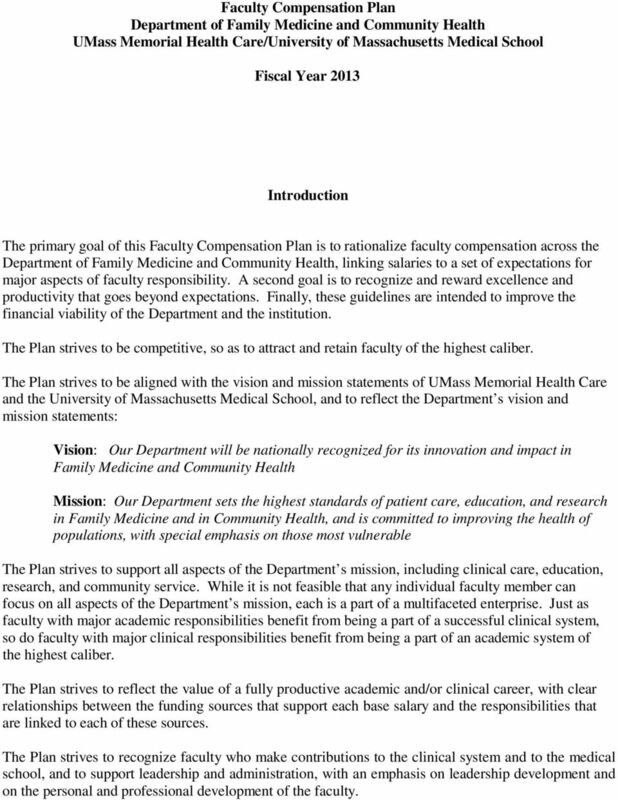 4 Page 2 Administration The Plan will be managed in conjunction with guidelines developed by the Board of Directors and the Finance Committee of the UMass Memorial Medical Group, and will be consistent with policies of UMass Medical School. The Department Chair is responsible for the Plan. 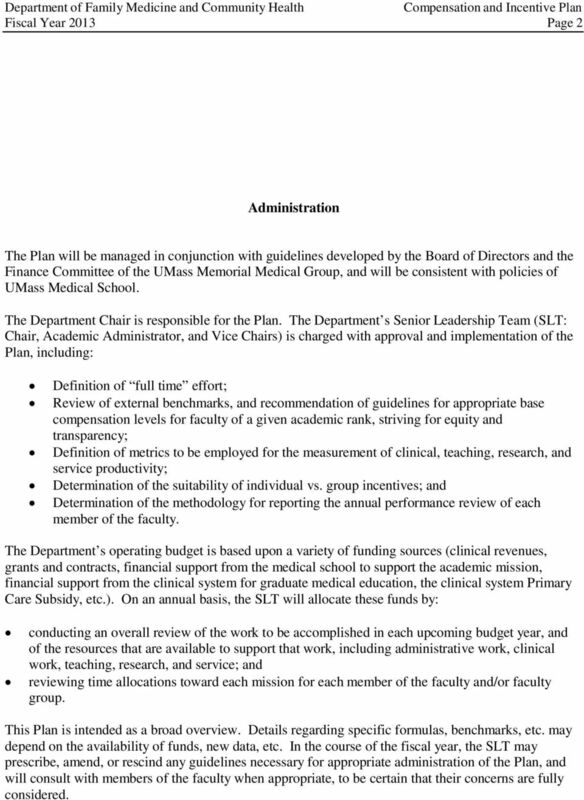 The Department s Senior Leadership Team (SLT: Chair, Academic Administrator, and Vice Chairs) is charged with approval and implementation of the Plan, including: Definition of full time effort; Review of external benchmarks, and recommendation of guidelines for appropriate base compensation levels for faculty of a given academic rank, striving for equity and transparency; Definition of metrics to be employed for the measurement of clinical, teaching, research, and service productivity; Determination of the suitability of individual vs. group incentives; and Determination of the methodology for reporting the annual performance review of each member of the faculty. The Department s operating budget is based upon a variety of funding sources (clinical revenues, grants and contracts, financial support from the medical school to support the academic mission, financial support from the clinical system for graduate medical education, the clinical system Primary Care Subsidy, etc.). On an annual basis, the SLT will allocate these funds by: conducting an overall review of the work to be accomplished in each upcoming budget year, and of the resources that are available to support that work, including administrative work, clinical work, teaching, research, and service; and reviewing time allocations toward each mission for each member of the faculty and/or faculty group. This Plan is intended as a broad overview. Details regarding specific formulas, benchmarks, etc. may depend on the availability of funds, new data, etc. In the course of the fiscal year, the SLT may prescribe, amend, or rescind any guidelines necessary for appropriate administration of the Plan, and will consult with members of the faculty when appropriate, to be certain that their concerns are fully considered. 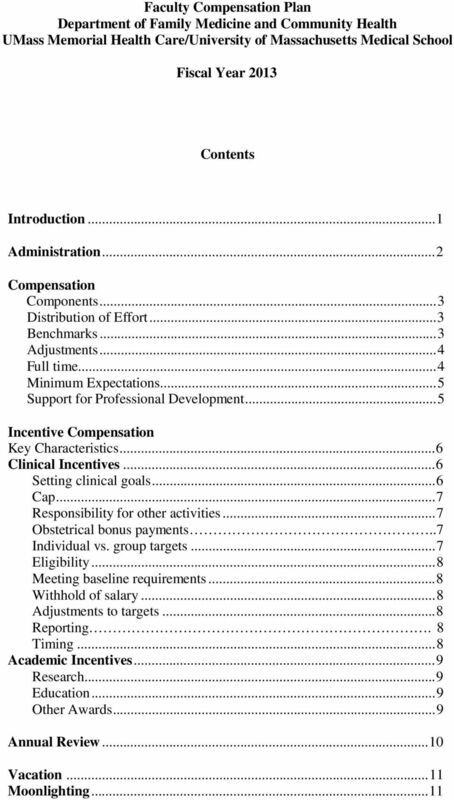 5 Page 3 Compensation Components: There are three components to compensation: base compensation, incentive compensation, and additional compensation: Base compensation is determined by utilizing appropriate external benchmarks for non-clinical and clinical faculty. In general, to qualify as a member of the clinical faculty, one should commit at least 0.30 FTE 1 to clinical activity; the Senior Leadership Team may grant exceptions. This component is considered as one s annual salary, i.e. as the salary paid for the execution of one s job, defined as a series of clinical, academic, and administrative duties. 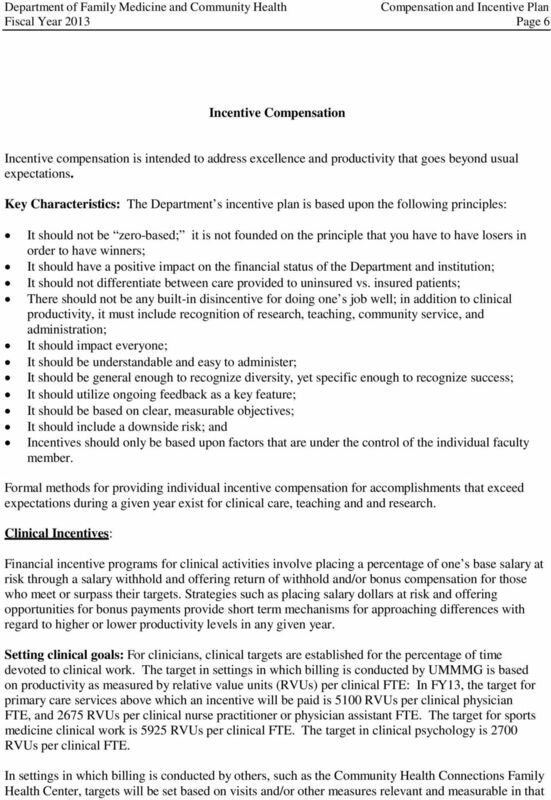 Incentive compensation is intended to address excellence and productivity that goes beyond usual expectations, and is addressed separately (see page 6). 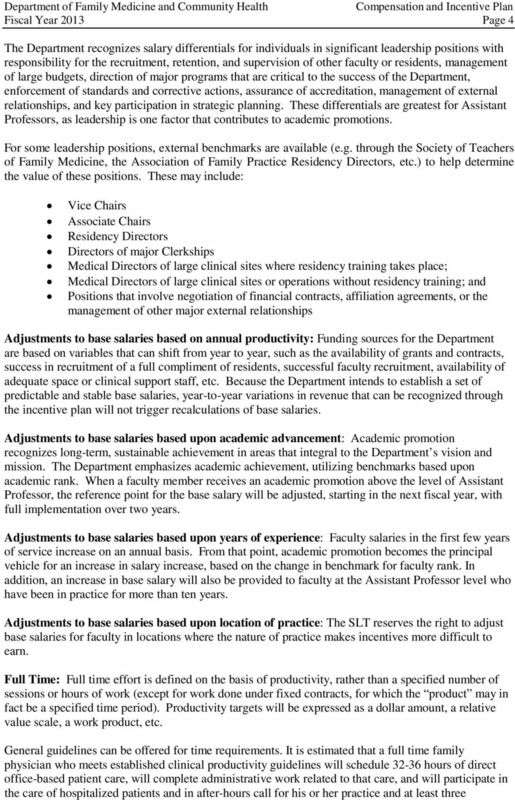 Additional compensation ( ad comp ) is utilized to recognize unusual or unexpected activities performed by the faculty member, such as serving in an interim leadership role, etc. 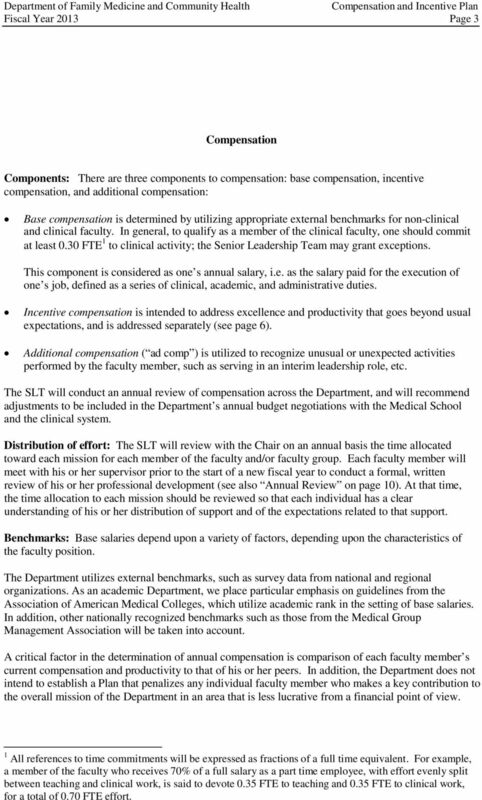 The SLT will conduct an annual review of compensation across the Department, and will recommend adjustments to be included in the Department s annual budget negotiations with the Medical School and the clinical system. Distribution of effort: The SLT will review with the Chair on an annual basis the time allocated toward each mission for each member of the faculty and/or faculty group. Each faculty member will meet with his or her supervisor prior to the start of a new fiscal year to conduct a formal, written review of his or her professional development (see also Annual Review on page 10). At that time, the time allocation to each mission should be reviewed so that each individual has a clear understanding of his or her distribution of support and of the expectations related to that support. Benchmarks: Base salaries depend upon a variety of factors, depending upon the characteristics of the faculty position. The Department utilizes external benchmarks, such as survey data from national and regional organizations. As an academic Department, we place particular emphasis on guidelines from the Association of American Medical Colleges, which utilize academic rank in the setting of base salaries. In addition, other nationally recognized benchmarks such as those from the Medical Group Management Association will be taken into account. A critical factor in the determination of annual compensation is comparison of each faculty member s current compensation and productivity to that of his or her peers. In addition, the Department does not intend to establish a Plan that penalizes any individual faculty member who makes a key contribution to the overall mission of the Department in an area that is less lucrative from a financial point of view. 1 All references to time commitments will be expressed as fractions of a full time equivalent. For example, a member of the faculty who receives 70% of a full salary as a part time employee, with effort evenly split between teaching and clinical work, is said to devote 0.35 FTE to teaching and 0.35 FTE to clinical work, for a total of 0.70 FTE effort. 7 Page 5 colleagues with full practices. The most successful physicians schedule their time so as to maximize patient access. In addition, throughout the year time will be devoted to professional growth and development, commitment to at least one Departmental activity, and commitment to at least one institutional or community activity. In our experience, the sum total of this activity can add up on average to a hour week. When non-clinical funding sources are provided to protect faculty time for commitments to teaching, research, administration, service, etc., it is expected that the same sort of effort should go into these activities as goes into clinical work. For instance, just as a four-hour patient care session requires additional time for administrative work related to that care, an afternoon devoted to teaching in a seminar setting also requires extra time devoted to preparation, evaluation, etc. Minimum expectations of the faculty: The Department expects the following of all employed faculty: When requested: o Serve as an advisor for at least one student o Be available to meet with and advise a learner who is interested in your area of interest o Serve as a discussant (on a panel, at a planning meeting, etc) of a topic related to your area of interest o For clinicians, host a medical student in the medical school s Longitudinal Preceptorship Program Participate as a member of the Department s listserv Make deliberate progress toward academic promotion Fully participate in systems for faculty support and supervision, including: o Annual setting of time commitments to each of the Department s missions o Goal setting o Annual and periodic faculty reviews Meet compliance requirements (billing, medical records, conflict of interest, etc) Participate in the Department s compensation plan For clinicians, compliance with the Department s clinical policies and procedures (credentialing, participation in quality-related activities, etc) Participate in periodic activities: o Department-wide: participate in at least one Department-wide activity each year o Programmatic: participate in regularly-scheduled programmatic activities (e.g. residency faculty meetings, etc) in your area o Local: participate in regularly-scheduled site activities Committees, etc: Serve on at least one committee, group, etc. Support for Professional Development: The Department supports a limited number of faculty to devote time to short term projects or professional development activities (typically 20-40% effort over 1-3 years) that align individual goals with the Department s strategic plan. A formal application process (described on the Department s web site) sets requirements for mentorship, specific goals and objectives, and outcomes. The application process should include discussion with faculty supervisors, assignment of a mentor, and sponsorship by a member of the Department s Senior Leadership Team (SLT: Chair, Vice Chairs and Academic Administrator). Decisions regarding support and oversight will be conducted by the SLT. 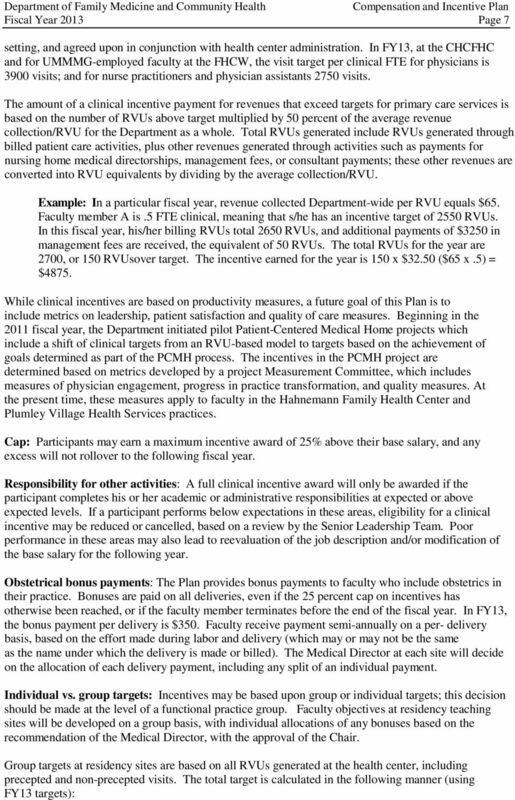 10 Page 8 Number of physician faculty clinical FTEs (after all teaching offsets have been deducted) x 2550 RVUs, plus Number of nurse practitioner or physician assistant clinical FTEs x 2675 RVUs, plus Number of residents in each year, times the number of visits required by the RRC, multiplied by 1.1, multiplied by.92 to convert visits into an equivalent RVU expectation (.92 being the RVU assignment for visits). Eligibility: Eligibility to participate in the plan shall be limited to Department physicians and psychologists, and Nurse Practitioners and Physician Assistants, as allowable by institution policy. Faculty who participate in an individual incentive program must be in practice for at least one full year, allowing for ramping up of their practice, before they are eligible for the program. In group incentive settings, new faculty will enter the group incentive pool immediately, with no allowance for ramp up. The SLT may grant exceptions. Baseline Expectations: There is a baseline eligibility requirement in all compensation plans that relates to professionalism, citizenship, and compliance with the policies of UMass Memorial Medical Group, UMass Memorial Healthcare and the University of Massachusetts Medical School. A faculty member s failure to demonstrate satisfactory performance may result in the forfeiture of the right to participate in salary increases and incentives. Examples include participation in required training, timely submission of Conflict of Interest Statements, compliance with billing and documentation requirements, active participation in faculty/staff performance evaluations, and all medical staff requirements including TST/PPD testing, flu vaccination or declination form and medical record documentation. Additional baseline requirements include meeting Departmental expectations, as outlined on page 5. If a faculty member terminates employment before the end of the fiscal year, payments and/or return of withholds will be calculated in accordance with guidelines established by the Medical Group. Withhold of salary: Beginning with the third year of employment, participants who have not reached their clinical targets will have 2% of salary put at risk through a salary withhold. At the end of that year, if they have achieved their target, the withhold will be returned. If they come within 90 percent of target, the withhold will be returned on a prorated basis (ie no return at 90 percent, half of withhold returned at 95 percent of target, etc.). Participants whose productivity is more than 10% below target will have their withhold increased to 5% in the following year, and those whose productivity falls more than 20% below target will have their withhold increased to 10% in the subsequent year. The Chair reserves the right to return a withhold when unforeseen circumstances beyond the faculty member s control contribute to an inability to hit a clinical target. Faculty whose clinical time is contracted to outside organizations and do not have a clinical target will not be subject to a withhold. 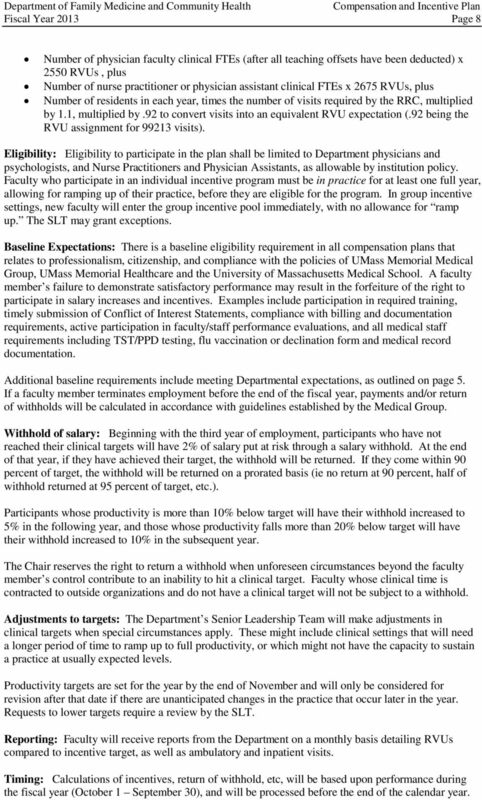 Adjustments to targets: The Department s Senior Leadership Team will make adjustments in clinical targets when special circumstances apply. These might include clinical settings that will need a longer period of time to ramp up to full productivity, or which might not have the capacity to sustain a practice at usually expected levels. Productivity targets are set for the year by the end of November and will only be considered for revision after that date if there are unanticipated changes in the practice that occur later in the year. Requests to lower targets require a review by the SLT. Reporting: Faculty will receive reports from the Department on a monthly basis detailing RVUs compared to incentive target, as well as ambulatory and inpatient visits. Timing: Calculations of incentives, return of withhold, etc, will be based upon performance during the fiscal year (October 1 September 30), and will be processed before the end of the calendar year. 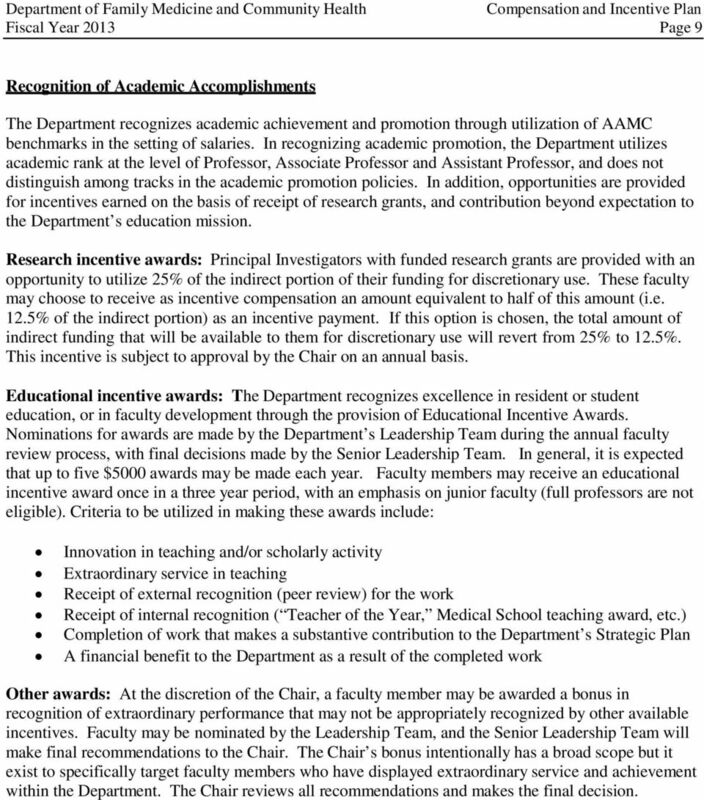 11 Page 9 Recognition of Academic Accomplishments The Department recognizes academic achievement and promotion through utilization of AAMC benchmarks in the setting of salaries. In recognizing academic promotion, the Department utilizes academic rank at the level of Professor, Associate Professor and Assistant Professor, and does not distinguish among tracks in the academic promotion policies. In addition, opportunities are provided for incentives earned on the basis of receipt of research grants, and contribution beyond expectation to the Department s education mission. Research incentive awards: Principal Investigators with funded research grants are provided with an opportunity to utilize 25% of the indirect portion of their funding for discretionary use. These faculty may choose to receive as incentive compensation an amount equivalent to half of this amount (i.e. 12.5% of the indirect portion) as an incentive payment. If this option is chosen, the total amount of indirect funding that will be available to them for discretionary use will revert from 25% to 12.5%. This incentive is subject to approval by the Chair on an annual basis. Educational incentive awards: The Department recognizes excellence in resident or student education, or in faculty development through the provision of Educational Incentive Awards. Nominations for awards are made by the Department s Leadership Team during the annual faculty review process, with final decisions made by the Senior Leadership Team. In general, it is expected that up to five $5000 awards may be made each year. Faculty members may receive an educational incentive award once in a three year period, with an emphasis on junior faculty (full professors are not eligible). Criteria to be utilized in making these awards include: Innovation in teaching and/or scholarly activity Extraordinary service in teaching Receipt of external recognition (peer review) for the work Receipt of internal recognition ( Teacher of the Year, Medical School teaching award, etc.) Completion of work that makes a substantive contribution to the Department s Strategic Plan A financial benefit to the Department as a result of the completed work Other awards: At the discretion of the Chair, a faculty member may be awarded a bonus in recognition of extraordinary performance that may not be appropriately recognized by other available incentives. Faculty may be nominated by the Leadership Team, and the Senior Leadership Team will make final recommendations to the Chair. The Chair s bonus intentionally has a broad scope but it exist to specifically target faculty members who have displayed extraordinary service and achievement within the Department. The Chair reviews all recommendations and makes the final decision. 12 Page 10 Annual Review Each individual faculty member will meet with his or her supervisor in a face-to-face review of faculty performance at least once each year. These reviews will focus on personal and professional development, including: the percentage of time devoted to administrative work, clinical work, teaching, research, and service; individual strengths and weaknesses; formal teaching evaluations (i.e. e-value; UMMS OME evaluations) major accomplishments in each of these areas; objectives for the year related to each of these areas; and Departmental resources required for success in these areas. For faculty in leadership roles, goals should include administrative responsibilities, including, when appropriate, improvement of the financial status of their area of responsibility, successful management of the Department s system of faculty evaluation, and participation in an activity that improves the effectiveness of the clinical system or the medical school. 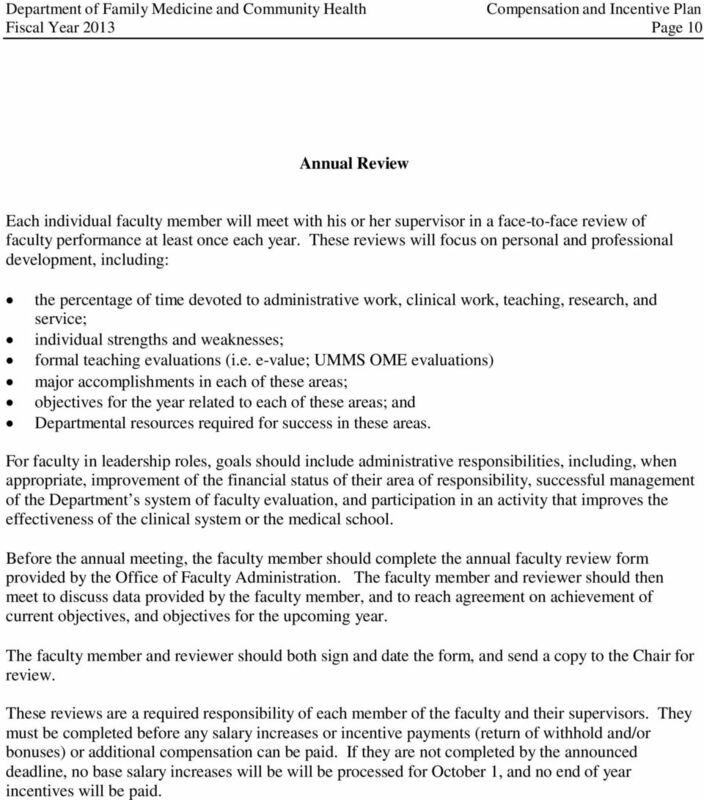 Before the annual meeting, the faculty member should complete the annual faculty review form provided by the Office of Faculty Administration. The faculty member and reviewer should then meet to discuss data provided by the faculty member, and to reach agreement on achievement of current objectives, and objectives for the upcoming year. The faculty member and reviewer should both sign and date the form, and send a copy to the Chair for review. These reviews are a required responsibility of each member of the faculty and their supervisors. They must be completed before any salary increases or incentive payments (return of withhold and/or bonuses) or additional compensation can be paid. If they are not completed by the announced deadline, no base salary increases will be will be processed for October 1, and no end of year incentives will be paid. 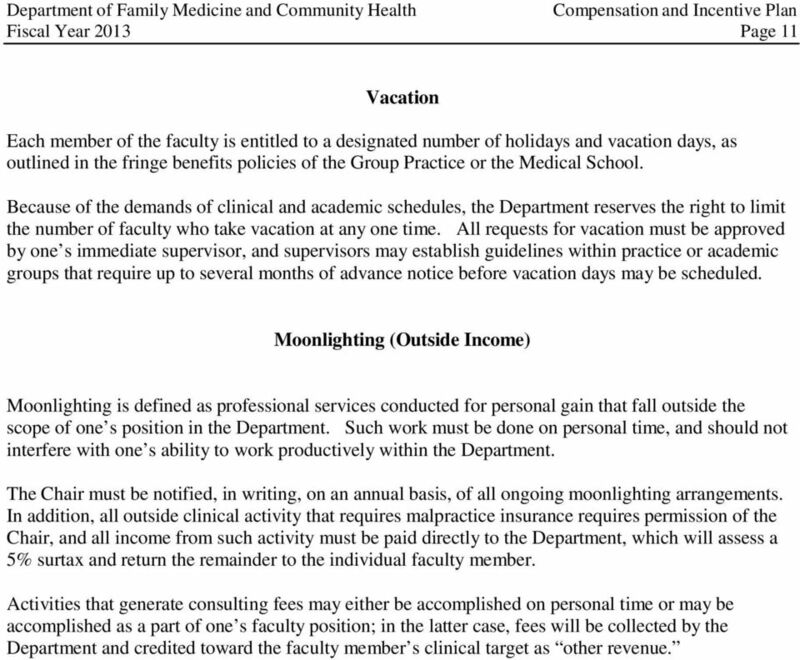 13 Page 11 Vacation Each member of the faculty is entitled to a designated number of holidays and vacation days, as outlined in the fringe benefits policies of the Group Practice or the Medical School. Because of the demands of clinical and academic schedules, the Department reserves the right to limit the number of faculty who take vacation at any one time. All requests for vacation must be approved by one s immediate supervisor, and supervisors may establish guidelines within practice or academic groups that require up to several months of advance notice before vacation days may be scheduled. Moonlighting (Outside Income) Moonlighting is defined as professional services conducted for personal gain that fall outside the scope of one s position in the Department. Such work must be done on personal time, and should not interfere with one s ability to work productively within the Department. The Chair must be notified, in writing, on an annual basis, of all ongoing moonlighting arrangements. In addition, all outside clinical activity that requires malpractice insurance requires permission of the Chair, and all income from such activity must be paid directly to the Department, which will assess a 5% surtax and return the remainder to the individual faculty member. Activities that generate consulting fees may either be accomplished on personal time or may be accomplished as a part of one s faculty position; in the latter case, fees will be collected by the Department and credited toward the faculty member s clinical target as other revenue. 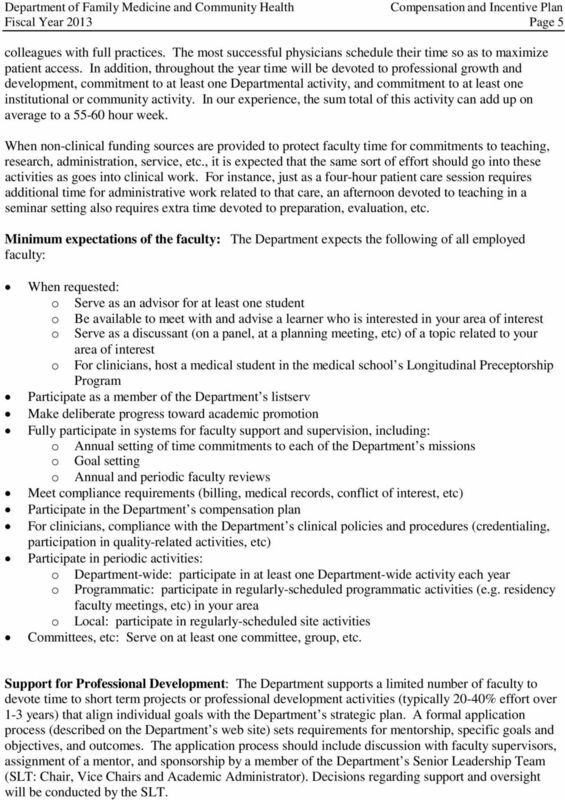 Guidelines for Departmental Faculty Compensation Plans. University of Massachusetts Medical School & UMass Memorial Healthcare, Inc. THE CHANCELLOR S DOCTORAL INCENTIVE PROGRAM. Commitment to Excellence with Diversity 2016/2017 APPLICATION. www.calstate. FACULTY RESEARCH The (UTHSC) College of Nursing invites applications for the position of a full-time tenure track position as a faculty member in the department of Advanced Practice and Doctoral Studies. We have made significant progress during the past few years in these areas. Central Role of Planning. The Academic Council. ACADEMIC GOVERNANCE I. Central Role of Planning. Planning is a critical element in successful academic governance. Without agreed-upon goals, it is impossible to make progress or measure performance. A. 2. All terms of compensation and workload must be included in the formal letter of offer submitted for approval to the Provost and the Chancellor.